It may surprise you to know that Joseph Stalin was the democratically elected leader of the Soviet Union. So were Khrushchev, Brezhnev, Andropov, and Gorbachev. In fact, every leader, at every level in the U.S.S.R. was elected to their office. The Soviet constitution clearly spells out that the country is a Democratic Republic, just like the United States. Everyone in that country had the right to vote for their leaders, just like we do. Except for one thing, there was only one person to vote for. There might be an opponent in an election, but everyone knew who they had to vote for; their very lives depended on it. In some cases quite literally, as Siberia is not a place to try to raise a family. Because of this, people would march to the polls and vote for the person that they were told to vote for. And the government had ways of tracking the objectors, so sitting out the vote wasn't an option either. Consequently, the Soviet leadership was typically elected with over ninety percent of the popular vote, and elections had near to one hundred percent participation. The ruling class was elected because the people were told who to vote for in a "free" election. This phenomenon could be termed "Totalitarian Democracy." It is a paper democracy, where the reality is that a totalitarian government controls the outcome of all elections through fear and ruthlessness. We would not consider this to be a true democracy, but in many parts of the world, this is what passes for an electoral system. In fact, most of the world's "democracies" function this way. You see it in countries as varied as Iran, on the religious end, to Venezuela, on the neo-communist side. For the most part, only the European, North American, Indian and British Commonwealth countries follow the model we think of as Democracy. But the new embrace of Totalitarian Democracy by the Republican Party, puts this country one step closer to that other "Democracy." Specifically, I am talking about what happened in Tampa to the supporters of Ron Paul. They were shut out of the convention, some of them stripped of their credentials, and their entire movement blocked from ever happening again. They have changed the rules to block any future insurgent or grassroots candidate from ever daring to threaten the lockstep march that they expect from their delegates, binding them to vote for whoever got the majority of votes in the state. I understand that faithless electors can be a potential problem, and I am terrified that in a close election, there might be some in the Electoral College. That said, party conventions are a way to make sure that the voices of all constituents are heard, and delegates are in a unique position to put pressure on the party to make sure it happens. Besides, what if we had found out a week ago that Romney did actually commit a felony on his taxes, wouldn't the party want a last chance to derail his nomination? With this new rule, that couldn't happen. I do want to say here, I am not a Ron Paul supporter. I agree with what my mentor Joe said about him, "He is correct with about 80% of what he says, but he is so horribly wrong about the other 20% that he can never be allowed to lead this country." Actually I think it might be closer to 50/50, but you get the point. That said, he started a brilliant grassroots effort in the Republican Party. He fired up his supporters in the way that Obama fired up those of us on the Left. He inspired genuine passion in his followers, and although I would never want to live in his America, I truly respect his love of country. I just don't agree with it, but I do respect it. This is more than the Republican Party will give him. For right or wrong, he is the spiritual father of the Tea Party that has swept the Far Right, and that movement rolled the Republicans into office across the country in 2010. And now, his insurgency has been put down, and he is being shoved to the side. My example of Stalin and the Soviet Union was deliberate; Ron Paul is Lenin to Romney's Stalin. (And I love the irony of comparing Lenin to Ron Paul.) Lenin inspired the Russian Revolution, set out it's principles, formed the ideological backbone of the country, and lived just long enough to see Stalin begin to destroy everything he had tried to build. The Soviets paid homage to Lenin, worshiped at his tomb, but abandoned the core of his work. He became a veneer for a brutal totalitarian regime that was no different at it's heart than the Tsars that it replaced. Ron Paul promoted the idea of a true libertarian Utopia: or Dystopia, depending on your view. He fired up his supporters to get them to try to institute it, only to watch as the Republican Party co-opted it, and turned it inside out to use as a weapon for a new Inner Party Oligarchy. Instead of a true free market, they want a gamed system that supports the Mega-Corps over everyone else. Instead of a true limited government, they want to take government out of your lives and put it back in the bedroom where it belongs. Instead of an almost non-existent military presence outside of this country, they embrace the rolling war machine of interventionist foreign policy. In other words, they hold the man up as an Icon for their movement, just like Lenin, but destroy everything that he stands for. And then, just like the Great Purge of the Soviets, they eradicate all of his supporters, and exile them to a political Siberia where they have no voice and cannot rise up against the hegemony. The Republicans have already purged the White Russians, the Moderates, and now they are turning against their own, the Reds, the Libertarians. In this model, I wonder who will be Trotsky and Zinoviev. But unfortunately, this comparison goes even further than the inner party purges of the Soviets. They got the rest of their country to go along with the single party rule, through intimidation, propaganda, criminality and outright buying of the vote, much like you see the Republicans doing today. They got people to understand that if they did not vote the "right" way, they could forget about having a good life, either individually or collectively. We see this today in the United States. 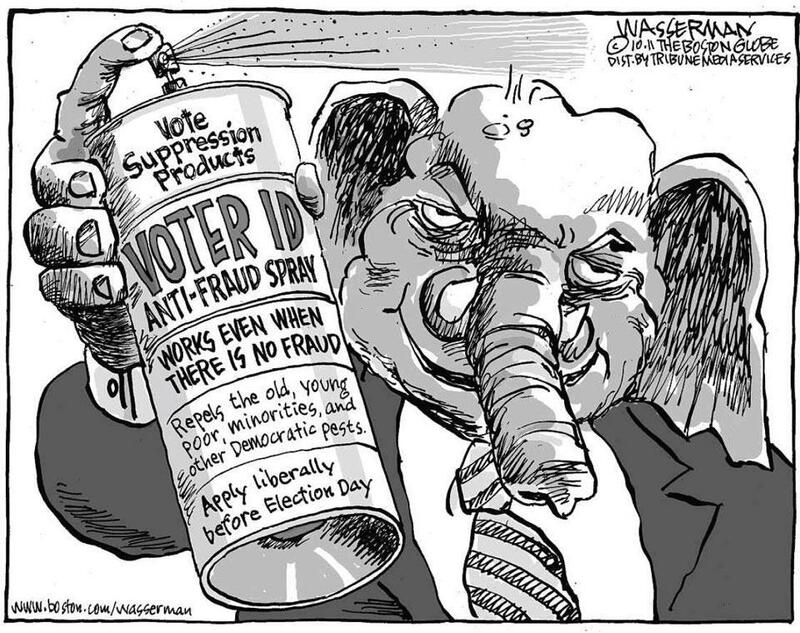 Voter Purges, I.D. laws and other voter suppression tactics are aimed at intimidating people so that they will not vote. Lies echo across all of the media, both in ads and in the solemn pronouncements of supposedly "independent" new agencies. Federal voting laws are trashed, and there is a high possibility of voter fraud with the electronic voting machines that are not secure. And to top it off, the Billionaire Set has said that is no limit to the amount of money that they will spend to get the election results that they want. More frightening that this, however, is the Soviet way that they are getting people to vote against their own best interests. Long gone are the days when a few wedge issues would get the middle and lower class voters to turn against things that would make their lives better. That is still a tactic in use, but now preachers and bosses just tell people who to vote for. As an incentive to make sure that people vote the Right way, the Catholic Church says that it will deny communion, a central sacrament, to anyone who ever votes Pro-Choice. If you know what is good for you, and you want to remain in your church, you'd better vote the way the church tells you to, even if it goes against your own conscience. Similarly, employers do the same thing. Generally, they are less blatant about it, although there have been instances where this is not the case, but still they make it known who they want you to vote for. A simple statement like "if the Democrats win this fall, we may have to reconsider the size of our workforce," will guarantee a number of people voting a particular way. In this case, they vote against their overall self interest, to satisfy a very narrow self interest of not being unemployed. I do want to make clear, this is not the full Soviet Totalitarian Democracy, where they check to make sure that you have voted the correct way. It is more on the order of an extreme form of peer pressure, coupled with intimidation and suppression, but it might work. Remember, all that is needed is fifty percent plus one vote. Every vote turned through these tactics means that the Democrats need to get two; one to cancel out the turned vote, and one to trump it. This is how the system works, and all you have to do is look around the world to realize that the "Other Democracy" is actually the more common one. Today, it is the Ron Paul Libertarian Republicans that have been shut out, tomorrow it could be everyone else in the country. I am reminded of what Ben Franklin said when asked what kind of government the new United States would have. His reply was, "A democracy, if you can keep it." We need to make sure that we keep it.